Dubai: Despite rising spend on halal food and beverages worldwide, there are a few mergers and acquisitions in the global halal F&B market, industry experts said at Gulfood 2016 on Monday. Hassan Bayrakdar, managing director at Raqam Consultancy, said that “a lack of awareness of the benefits” of acquiring or merging with halal food companies is the main reason why such activity is muted both regionally and globally. 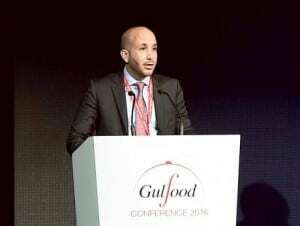 Adnan Halawi, senior proposition manager at Thomson Reuters, during a Gulfood 2016 session in Dubai yesterday. There are 1.7 billion Muslims globally, estimated to have spent $1.1 trillion (Dh4.03 trillion) on food and beverages in 2014, according to the Halal Food M&A Activity and Opportunities report produced by Thomson Reuters in October last year. In another of its reports released earlier this month titled ‘Global Islamic Economy Report’, Thomson Reuters stated that the global halal food market is forecast to grow to $2.537 trillion by 2019, up from the $795 billion it was estimated at in 2014. Another reason for the limited M&A activity in the halal F&B market is the lack of understanding of halal regulations in each country, according to Bayrakdar. “[If] the [halal] regulation is not well understood for them, they try to avoid it… they are afraid of being rejected — in case they apply the Malaysian halal regulation, in the UAE there’s a different regulation,” he said. There were “over 400 food-related deals in the OIC [Organisation of Islamic Cooperation] markets or with a halal or Muslim component … [with] an aggregate value of $2.1 billion between 2012 and 2015”, according to the Halal Food M&A Activity and Opportunities report. Half of those deals were in food manufacturing, mostly in Asia Pacific OIC countries. In recent years, there have been a few deals in the F&B market in Muslim-majority countries in the region. Private equity firms Abraaj Group and TPG Capital bought a majority stake in Saudi Arabia-based fast-food chain Kudu last year, and Brazil’s BRF, the world’s largest poultry producer, raised its stake in Abu Dhabi’s Federal Foods in 2014. Halal food consumption is the highest in Indonesia, with a market worth $190 billion, followed by Turkey ($168 billion), Pakistan ($108 billion) and Iran ($97 billion), according to the Global Islamic Economy Report. In the next three to five years, Bayrakdar expects M&A market to be “more and more developed” in the OIC countries. The trillion dollar Halal market continue to grow annually…and this is without external finance. imagine what private equity/Islamic finance could do!